Designer dog clothes for small dogs to large dogs and puppy clothes too. Dresses, sweaters, hoodies, coats and more for fun or formal for your best friend at Snooty Pooch Boutique. Dog clothes are fun and practical. Providing your dog or other pet with luxury dog clothes to keep them warm and protected from the sun and snow. Popular items include: dog coats, dog raincoats, dog hoodies, and pet sweaters. 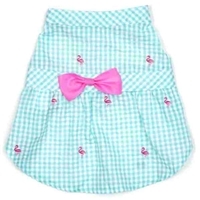 Cute tennis dresses for small dogs. 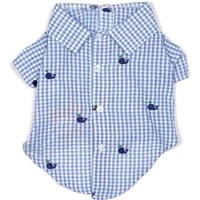 A lightweight seersucker dog shirt for small to large dogs. Yes, some dogs come equipped with their own heavy fur coats, but some dogs have less layers of fur than others and are genetically not suited to the cold environments to which they have been transplanted. Consider the Chihuahua, a toy dog breed with very short fur originally from Mexico, now having to bear the frigid temperatures just to relieve itself. Imagine how uncomfortable these dogs are when taking a winter walk! – as uncomfortable as you would be if you went outside without clothing. Some would laugh at the idea of putting clothes on a dog, but there are dog owners that see their pet shiver violently after being outside in the cold winter temperatures and yet won’t put clothing on their dogs for fear of appearing odd or not masculine. If you are concerned about your dog being cold, it is actually a very good thing to put a coat or sweater on him or her. Today, putting a dog coat or dog sweater on a dog is not odd, it’s actually very chic and shows what a concerned pet parent you are! It’s also great fun dressing them for Christmas and other holidays. Afraid of looking like a prissy pet owner?? How about sporting a dog sweatshirt with a mohawk hoodie! Or dress them in an Army jacket leather bomber jacket or a parka. Or there’s the popular biker chic Born To Ride Motorcycle Jacket for your motorcycle bike rides - see how it makes heads turn! Snooty Pooch Boutique carries a wide variety of luxury dog coats, jackets, sweaters, hoodies and more to keep your dog warm this winter, or just for fun! Dress up your best little girl in these adorable and fashionable dresses. 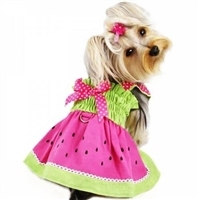 For the stylish and fashionable pet owner, we feature designer pet clothing! Keep your best friend warm and dry with these adorable coats and jackets. For fun or fancy, a stylish way to take your pet for a walk. Designer tutus for fashionable dogs and puppies perfect for Holidays or any day. Dog clothes for special occasions: Wedding apparel, fancy dog dresses, tuxedos, special occasion collars and more. li>Bow ties for fun and for fancy. Couture high fashion for your special dogs, cats and other pets too. Snooty Pooch Boutique offers a wide variety of pet costumes for Halloween, Christmas or anytime. Sizes to fit small to large dogs. Clothing for those LARGE DOGS that were hard to shop for... until now! The small dog and puppy boutique for small dog clothes, puppy clothes and apparel to fit small dogs and toy dog breeds.